So, it’s been a while since I’ve posted any new recipes. We have had such a busy summer…full of family, friends, traveling, and lots of fun! Trust me…I’ve still been cooking! It’s totally my favorite pastime. It just takes time to get the right photos and to blog about it…and I decided to dedicate all of my time to my family this summer! Having a 1 and 3 yr old at home is a full time job in itself…if you have kids, you totally know what I mean! They are growing up so fast and I must cherish every waking moment with them. This past weekend we were spending some quality family time at our lake cabin. I came across this great recipe from one of my favorite food bloggers and I was very interested in the ingredients she used. These muffins have avocado in place of the oil/butter. This seems like such a great idea and can’t believe that I have never thought of this before! I’m always trying new ways of cooking with healthier substitutions. These turned out so perfectly and I’m seeing a lot of avocado baking in my very near future! These muffins are perfectly moist and very light in texture and bursting with fresh blueberries. Preheat oven to 375 degrees F. Line a muffin tin with 12 paper liners or use non-stick cooking spray. In a medium bowl, stir together flour, baking powder, baking soda, salt and cinnamon. In a separate bowl, add avocado and beat on medium speed until smooth. Add sugar, and beat until well blended. Add egg and vanilla and beat until mixed well. Then add yogurt and milk, beating just until combined. Add the flour mixture into the batter beating just until combined. Gently fold in blueberries by hand. 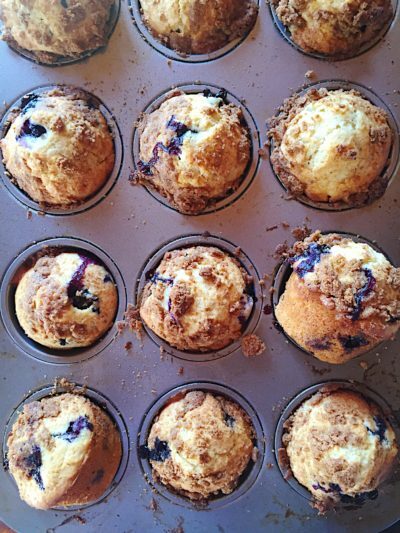 Spoon batter into prepared muffin cups, and sprinkle with streusel topping. Bake for 22- 25 minutes, or until a toothpick comes out clean. Allow to cool for about 10 minutes before removing. Mix all the ingredients together by hand until the mixture resembles a coarse crumble. If the streusel seems to wet, add another Tbsp flour.